The CiPEHR study site in early summer. Photo by John Wood. The carbon cycle is the means by which carbon is moved between the world's soils, oceans, atmosphere, and living organisms. Northern tundra, permafrost, ecosystems play a key role in the carbon cycle because the cold, moist, and frozen soils trap organic material and slow their decomposition. This very slowly decaying organic material has caused carbon to build up in the Arctic during the past thousands of years. Historically, the tundra has stored large amounts of carbon because soil decomposition in permafrost was very slow. Now, warming in the Arctic is causing the permafrost to thaw and the tundra to become warmer and dryer. As the earth warms and permafrost thaws, this previously frozen carbon is released as carbon dioxide and goes into the atmosphere, turning the tundra into a source of carbon, rather than a sink. We are using carbon isotope techniques to measure how much carbon comes directly from soil decomposition and how much comes from plant respiration. 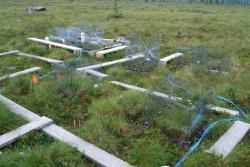 This will help us understand more about the source/sink dynamics of the tundra. Little is known about respiration in the arctic winter, but our winter sampling is improving. With more data we will have a better idea of how much carbon is lost during the long, dark winter. Together our summer and winter data will help improve global carbon models by adding a more realistic representation of the Arctic. Because carbon dioxide is a greenhouse gas, any additional carbon dioxide lost from permafrost ecosystems creates a positive feedback that leads to even further warming. 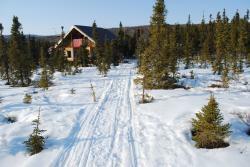 The cabin near Healy, Alaska in winter. Photo by John Wood. The research team is based at a remote cabin near the small town of Healy, Alaska, about 100 miles south of Fairbanks, Alaska. The cabin functiones as both a research base and living quarters. There is no running water and all supplies have to be brought in either by snow machine or on foot, depending on conditions. The cabin is also home to a team of sled dogs, so things get pretty noisy around meal times. The sampling site, (Carbon in Permafrost Experimental Heating Research—CiPEHR) is a tundra ecosystem warming experiment located in Alaska's discontinuous permafrost zone. Teacher Karen Temple-Beamish discusses ongoing research on 'Carbon Balance in Warming and Drying Tundra' in Healy, Alaska. Karen Temple-Beamish has taught 8th grade Earth Systems Science and high school Environmental Biology at Albuquerque Academy for 18 years. In addition to teaching science, Karen is her school’s sustainability coordinator, environmental club sponsor and director of the Desert Oasis Teaching Garden. Karen has participated in the Woodrow Wilson Environmental Institute in Costa Rica and in the Japan Fulbright Teacher Exchange Program. More recently Karen has become an EE Capacity’s Community Climate Change Fellow, and a 2015 NOAA Climate Steward. Karen received the 2013 Presidential Award for Excellence in Science Teaching. She has a B.S. in Biology from the University of New Mexico and a M.S. in Environmental Science from Indiana University. Marguerite's research is focused on understanding how warmer temperatures and permafrost thaw will affect carbon losses from arctic tundra. Arctic permafrost soils store large amounts of carbon, which could be released to the atmosphere, in a warmer climate. We expect an increase in carbon losses as warmer conditions promote decomposition of carbon stored in permafrost soils. However, warming and thaw also promote plant growth, which can increase short-term carbon storage. The experiments at the Carbon in Permafrost Experimental Heating Research project (CiPEHR) were established in 2009 to disentangle these opposing factors, and gain a better understanding of arctic tundra carbon dynamics. Meghan had purchased an icecream machine! The rubus was devine. Thanks for all your help. I felt so well taken care of by everyone on the arcus team and of course the wonderful research team. I will miss them. Eloquently written Karen! How was the Rubus ice cream and how was it made? Safe travels home!